What is Common Property Rights? Common property is defined to be any renewable natural resource unit needing management under Common Property Rights to be sustainable. Everything else is treated as private property. Many units of renewable natural resources, like forests, water sources, fish farms, and farm fields, may be managed sustainably as private property under existing property law, as for example by collective management regimes, government programs, corporations, or farmers. Common property thus refers to managerial rather than physical characteristics. Common property typically includes the air we breathe, the rivers we share, the oceans, and so on. Common Property Rights is a new approach to the legal right to manage, but not own, the health of an ecosystem service whose wise stewardship would benefit the common good. 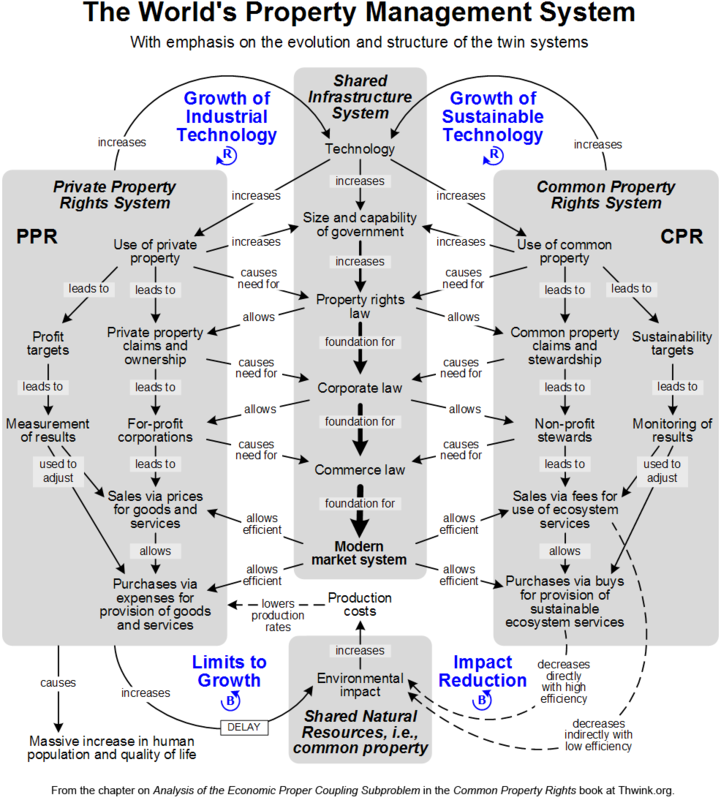 The diagram shows how Common Property Rights is the mirror image of Private Property Rights. Click on it to hide or show the butterfly. The butterfly represents the symmetry of the system and the importance of the Shared Infrastructure System, which is much like the body of the butterfly. Here is the full size diagram. The Common Property Rights system manages common property, like the air we breath and the water we drink. The Private Property Rights system manages private property. 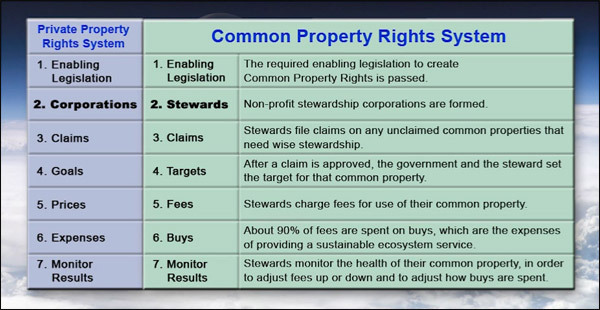 Common Property Rights uses non-profit stewardship corporations called stewards, while Private Property Rights uses for-profit corporations. Stewards charge fees for ecosystem service use, while corporations charge prices for products and services. And so on. A funny thing happened a long time ago. We forgot to invent Common Property Rights! All we invented was Private Property Rights. Ever since then, the human system has been like a butterfly with one wing. It's imbalanced. The world's Private Property Rights has brought unimaginable benefits, which exploded with the Industrial Revolution. But that's come at a steep price. 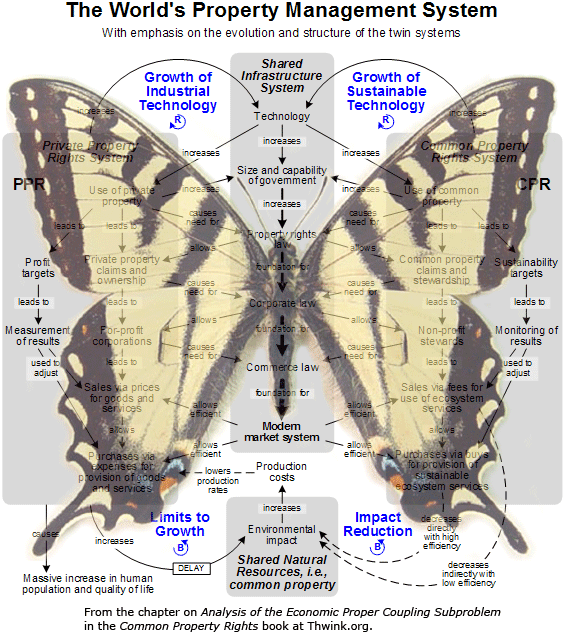 It's unsustainable because the butterfly is missing the wing of a Common Property Rights system. That system would be as universal, generic, and efficient as the world's already existing Private Property Rights system. Once we have a butterfly with two strong wings, we will witness the Sustainability Revolution. It's benefits will be just as large and unimagined beforehand as those of the Industrial Revolution. Common Property Rights is a solution element for what's called the environmental proper coupling problem. 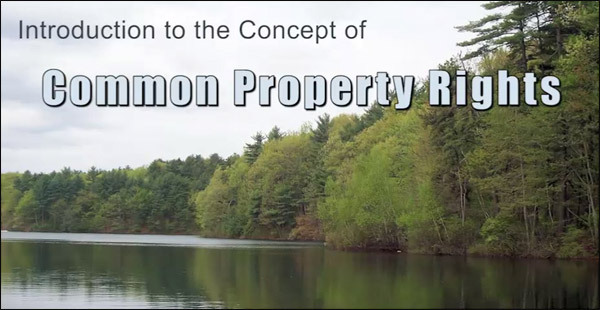 For a full description of the Common Property Rights solution element see this page. Cover photo by the author on December 5, 2003 on Samos Island, Greece. Pythagoras was born on this island in 570 BC. The photo shows a region still in common and used by goat herders. The goats have nibbled all the grass close to the ground. 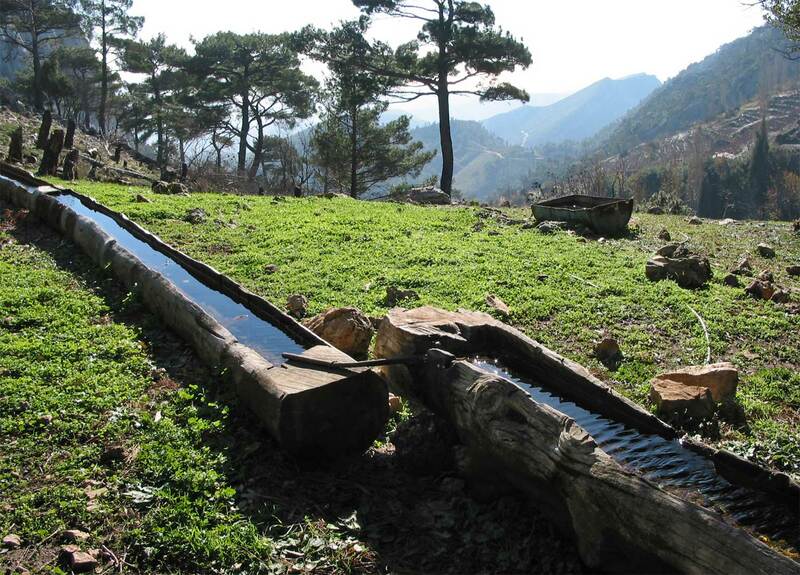 The hollowed out logs contain sparkling natural spring water for the goats, as earlier logs have for thousands of years. In the distance may be seen terraced hillsides for olives, the tree most revered by the ancient Greeks because it produced such an abundance of oil. Here's the full photo. The carrying capacity of the island slowly collapsed, due to deforestation and erosion caused by replacing indigenous trees with olive trees, which have tap roots instead of surface roots. This caused, for example, a spring that had formerly gushed out 400 cubic meters of water a day to fall to a trickle. This is a serious book for serious activists. If you're dissatisfied with progress on solving the sustainability problem and suspect there must be a better way to go about solving the problem, then this book is for you. 1. As an eBook file PDF , 6" x 9" page size, for reading on eReaders or computer screens. 2. As a page size file PDF , 8.5" x 11" page size, for printing. The book summarizes the research at Thwink.org. The thesis is that classic activism has failed to solve problems like the sustainability problem because its solutions do not resolve root causes. The reason popular solutions don't resolve root causes is problem solvers have been using a process that doesn't fit the problem. This message is driven home time after time in the book. The argument is supported by a boatload of examples, models, diagrams, data, history, and so on. It's a serious book for a serious problem. 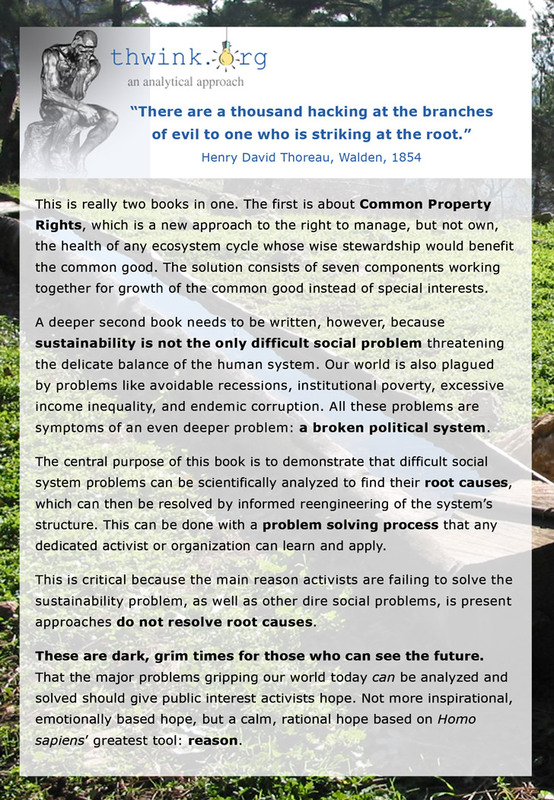 The book presents a process that fits the problem, a detailed analysis of the complete sustainability problem, and twelve sample solution elements. The flagship solution element is Common Property Rights. This is so large it consumes all of Part One of the book. This is a mere a warm up act, however. Part Two is all about how The Process Must Fit the Problem. This explains why present problem solving processes are incapable of solving the problem. One that is capable is then presented: the System Improvement Process. Part Three is Analysis and Solution Convergence. This applies the System Improvement Process and is the real meat of the book. Note the subtitle: A Process Driven Approach to Solving the Complete Sustainability Problem. The complete problem includes all three pillars of sustainability: environmental, social, and economic. It thus includes the broken political system problem, which must be solved if we are to solve the overall sustainability problem. The book references the Virginia Administrative Code, section 9VAC25-720. This very long document is available in its entirety for your convenience here. Here is the detailed Table of Contents. Video 1 runs 15 minutes and gives an introduction to the concept. The key insight is that to solve a problem we must resolve its root cause. As simple as that sounds, it's not how the problem is being approached. The highlight is a short inset video about the similar work of Hernando de Soto, a Peruvian economist. The full seven minute video about de Soto is available here. Video 2 run 23 minutes. 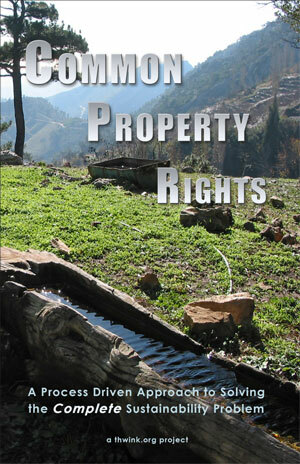 It presents the seven components of Common Property Rights as summarized above. The foundation is enabling legislation. Once that's passed stewards can appear. These are bolded because the whole Common Property Rights system revolves around stewards, just as the world's present private property system revolves around corporations in industrialized countries. Jack Harich is working with Philip Bangerter and Lyndyl Greer of Australia on several papers. Philip is leading the project. The papers will establish peer review for the viability of the concept of Common Property Rights. This will open the door for serious funding of research. If you would like to read, comment, or assist with the papers we have in progress or the project, please contact us. Here are the Vensim models ZIP used in the book. For how to run them see The World of Simulation. These are 6" by 9" pages. The small size makes for easier screen and eReader viewing. Summary of Analysis Results Table PDF - 1 page, from Chapter 16. Summary of Analysis Results. This is probably the most insightful page in the entire book. For discussion see this page. Chapter 10. The System Improvement Process PDF - 25 pages. See pages 121 to 128 for the five substeps of analysis. Chapter 17. Analysis of the Change Resistance Subproblem PDF - 72 pages because this is the crux !